This one-volume guide to a healthy congregation combines the wisdom of a rabbi with the expertise of an organizational development consultant to demonstrate the power of positive relationships and show how to avoid some of the common traps that can lead to serious conflict. Using the life of the synagogue as its central illustration, this book gives vital lessons for congregations of any faith on how to be a healthy community of believers. Leaders and congregants alike are shown how to incorporate all their gifts for the creation and support of a healthy faith community. Synagogue life is considered through case studies--struggles over what to do with an endowment fund, a social action committee that no one joins, changing a worship service time, clergy transitions--which are examined for what they reveal about the strugglesof congregations and their leaders to create healthy institutions. Each chapter integrates organizational theory and faith values in the pursuit of a deeper understanding of synagogue lfie. For non-Jewish congregations, the book offers rich insights into Hebrew texts and culture and the common elements between synagogue and church life. This House We Build enables both clergy and members to learn more deeply about creating and sustaining communities of faith in the course of inevitable transitions and everyday challenges. 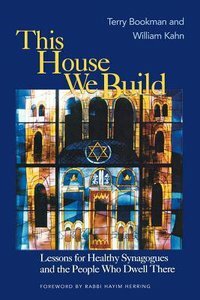 About "This House We Build"
Bookman is Senior Rabbi at Temple Beth Am, the largest congregation in Miami. He is active in dozens of Jewish, spiritual, and rabbinic associations.